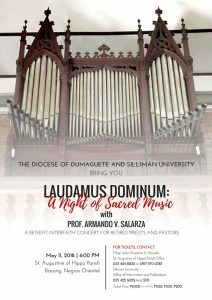 After the successful joint benefit interfaith concert in 2015 of Silliman University and the Diocese of Dumaguete, the historic Catholic church in the town of Bacong will host a night of sacred music at six in the evening of May 11, with its century-old pipe organ as a main feature. 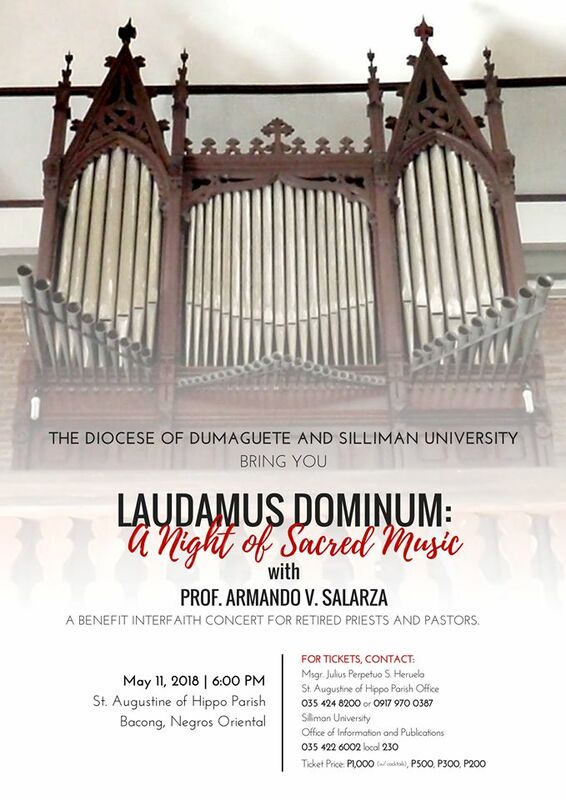 The Diocese, through the St. Agustine of Hippo Parish, is the venue of the second interfaith concert, dubbed “Laudamus Dominum: A Night of Sacred Music”. Silliman hosted the first run in February 2015. Proceeds will go for the care of senior and retired priests and pastors. The first interfaith concert, “Amare et Servire”, raised around P300,000, and the same amount was equally distributed through the Diocese of Dumaguete for senior and retired priests and the Silliman University Church and the United Church of Christ in the Philippines Negros District Conference for senior and retired pastors. Renowned Filipino bamboo and pipe organist Prof. Armando V. Salarza will lead the different performing groups, composed of artists from the College of Performing and Visual Arts of Silliman and the Negros Oriental Music Society. There are only 300 tickets available due to the limited space in the church. Tickets are sold at P1,000 (which includes cocktails after the concert), P500, P300 and P200, and are available at the Office of Information and Publications of Silliman University. Those interested to watch the benefit concert may call (035) 422-6002 local 230, or (035) 422-7194. The interfaith concert was inspired by Silliman President Dr. Ben S. Malayang III and Dumaguete Bishop Julito B. Cortes. It was an initiative driven at bolstering how, despite different religious affiliations, we remain one as a Christian community and united in serving God and His people.